In this episode of the eCW Podcast Season 3, we traveled to California to visit Madera Community Hospital to discuss Population Health. Think of eCliniSense as a virtual physician’s assistant that never takes a day off. 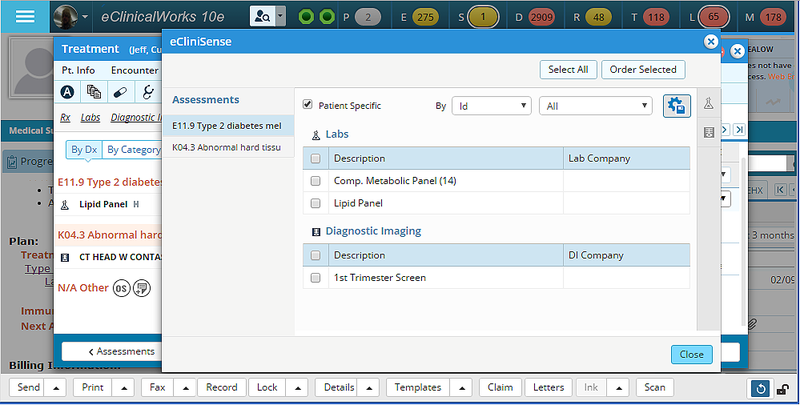 Once a doctor has established a history of diagnoses and orders within eClinicalWorks, eCliniSense will automatically display all medications, labs, x-rays, and other procedures that he or she has ordered in the past for that diagnosis – information that can be recalled by patient or diagnosis code. Electronic Prescribing of Controlled Substances (EPCS) is now legal in all 50 states and growing rapidly in popularity. 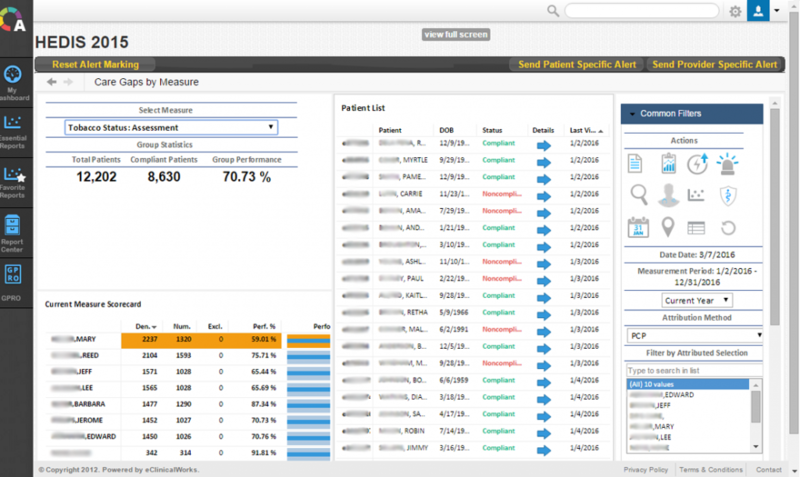 eClinicalWorks supports EPCS, allowing physicians to prescribe directly from the EMR treatment window by utilizing a hard token password generator. With EPCS, providers reduce paperwork, increase efficiency, and ensure that controlled substances are prescribed accurately and securely. The Healthcare Effectiveness Data and Information Set (HEDIS®) is the primary tool that health plans use to gauge the quality of their service and care. Employing 81 measures across five domains of care, HEDIS® is used by more than 90 percent of health plans. eClinicalWorks helps providers track, measure and report HEDIS® quality metrics for maximum effectiveness and transparency. Adam: Welcome to this edition of the eClinicalWorks Podcast, I’m Adam Siladi and we’re here at Madera Community Hospital in Madera, California, speaking with them about what’s made them so successful in their technology implementations. With me today is Karen Paolinelli, chief operating officer, and Nikki Resendez, who is the certified trainer and clinical technician? Adam: We actually saw you not too long ago at our National Conference in Nashville, Tennessee this year. So, what’s new since then? Nikki: So just getting the back-office to use it more, the defaults and things like that, we have it built in for our providers but not so much for our back-office, so getting them to use more order sets – and we’ve been building more templates, hiring more providers so getting everyone on the same page. Adam: And we’re here in your training center, so I’ve heard that that’s getting a lot of use lately. Adam: Well it’s only been two months. Nikki: Yeah, but we’re definitely eager to start with some of the new things. Adam: And I bet you’re really glad you have that certified trainer certification in a situation like this where you have so many new providers coming on. Now, you have mentioned eCliniSense and why is that so important to you? What about that stands out? Karen: You know, it was always there and I’ve never used it until I went to the conference and I realized that maybe it isn’t turned on or working right and that’s how I didn’t know how valuable it could be, but once I saw it at the conference demonstrated to me, I was like “oh wow” because, you didn’t mention this, but I’m also a provider, I’m a nurse practitioner and when I can go in there and hit eCliniSense, I can change the drop downs to all providers, and I can look at, like if I’m treating a patient with hyper tension, I can look at the past treatments for that patient or for any patient with the diagnosis of hypertension, and it will give me the idea of what patients are being treated for in our practice for hypertension, and it gives you any labs that need to be ordered for a patient with hypertension, any medications that might need to be ordered, if there’s an x-ray that may be associated with that type of a diagnosis, then order that, but what makes it nice is cause it’s just all there, you don’t have to search for the medicine and things like that. Usually when I do pick those and I use eCliniSense, it’s always the drugs that I use, so it just makes it very easy to click, click, click and order all that stuff, it comes right over into your EMR and it’s a very neat feature. Adam: More efficient than searching each individual medicine, like you said. And then you have to pick the dosages and things like that so eCliniSense has done that for you. Karen: And it brings everything over, right into your progress note, so it’s great. Then you just send it on to the pharmacy or activate the order and it goes over and they order the x-ray and the labs and it’s all one smooth click. Adam: Now, for those people who might be watching who haven’t seen our podcast from the national conference tell us a little bit about your organization and your patient population? Karen: Our clinics where we use eClinicalWorks are nationally certified rural health clinics and we are owned by Madera Community Hospital, and we service all patient types and all different insurances and all different ages. Karen: All of them. All payers, we take medical, Medicare insurance, self-pay – whoever wants to come in. Karen: We truly are really a safety net for our community. We see pretty much everybody. Adam: That sounds like it’s good to have somebody like you in the neighborhood. So, with that wide-ranging population – lots of different demographics and different types of people walking through the door, what types of population health measures are you focusing on at the moment? Karen: Well, we are looking at the HEDIS measures, that’s what we’ve been focusing on in our clinic. We’ve been working with eClinicalWorks making sure that we can break that down by our different clinics. I did mention that we do have 3 clinics, 2 here on campus – 1 is a family practice clinic and the other one is a specialty clinic. Then we have one in Chot Chilla, it’s a family practice clinic and we do have some specialists that rotate up there. So what’s really unique about our place is that as patients come and they get seen by the primary care providers, our specialists are right here on campus also and we can easily make a referral to that specialist. So what we do is contract with a lot of specialists, they come here, they see patients, and our patients just come on over to our specialty clinics and they see the doctor on the day that they’re scheduled. What’s nice about that is they’re in our EMR, they’re using eClinicalWorks also, and so all the information about the patient is right there, available to that specialist, where, if you have the send them to a different office, then you have to copy everything, somehow get it to their electronic record, or mail it to them. Sometimes, if you give it to the patient, they don’t take it, sometimes if you send it to the offices, they don’t get it for some reason, so this is really great. Adam: So having all those different specialties under one EMR and one database, making a big difference for you. Now, for the HEDIS measures, you’re using the eClinicalWorks HEDIS dashboards, is that correct? Adam: And which measures, in the HEDIS dashboards, are you particularly focusing on? Nikki: So we have six core, right now. But we have it from the QHI Benchmark, so there’s a total of six that we look at. Karen: We’re looking at hypertension so controlling patient’s blood pressures in our facilities. We’re looking at smoking status and treatment for that, smoking addiction. We’re looking at BMI. We’re looking at medication reconciliation. And we’re looking at making sure our patients that have diabetes under control. And what’s really nice about the HEDIS measures is that it looks at all your patient population and, at a glance, you can monthly look at where you’re at with your measures. I’m able to click on and see if there’s a benchmark – you can look at the benchmark and see if we’re meeting our benchmark, and if we’re not meeting our benchmark, I can very easily scroll down to what patient it is I’m not meeting the benchmark on. So you click on the patient, it brings it up, I can say “okay this a patient, next time he comes in we need to be after him on making sure that his diabetes is under control, or maybe adding another medication because his hypertension’s out of control” – so it’s really, really helpful. Adam: And are you planning to use the closed loop alerts with that, as well, to get that back into the EMR? Karen: We do use alerts, we’ve always used alerts, and it’s helpful. One of the things that I’ve found on the provider’s side, is that, although the front office and the back office to really well with alerts, the practitioners don’t do as well with them. And when a doctor goes in to see a patient, they don’t pay attention to all the excess stuff, they go right into their progress note, they look at that. If it’s something that the doctors need to do, we go to their appointment that’s schedule and we make sure that it’s in their chief complaint – what are they here for, hypertension is out of control, or we’ll put in there “see the alert;” we make it very clear so it’s on their progress note, that they know that this needs to be addressed and they need to go to that. Otherwise, they don’t tend to look at the alerts, unfortunately, but our staff does and it works really well for the front-office staff and the back-office staff. Adam: I guess sometimes you need to tweak the way you’re doing something or the way something’s designed to make sure that the intended audience is doing what they need to do to get the most out of it and it sounds like you’re doing that. Karen: Yes, we are. The doctors like that and it reminds them, and they don’t have to look in a lot of different places to get the information, and they are busy, and of course they have a lot of patients to see, so we try to make it as easy as possible. Adam: Now when you listed your quality measures, one of them stood out – you had several measures that were directly related to conditions and condition management, and then you had medication reconciliation, which seems more of like a process-type thing, why is that important to you? What effect does that have in your office? Karen: Well it’s very important to our providers, it is one of our meaningful use measures, also, so it’s important to us as a practice, but at the end of the day it’s important that we have medicine for the patients when the providers see them. 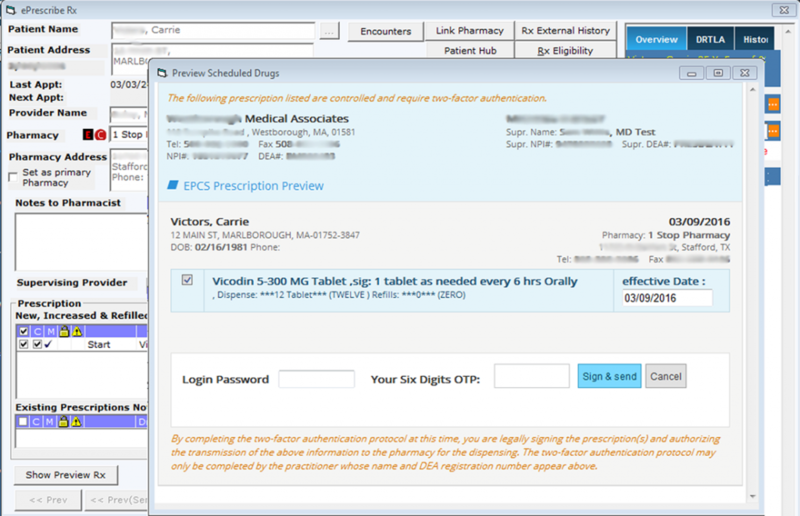 So, we have a pretty good workflow, and with eClinicalWorks it makes it very easy to update our medications that the patient’s taking, and if the patients forget their medicines, they have an external RX little hub that we can click on and we can get a list of all their medicines to their pharmacy which is very, very handy. Adam: That, of course, pulls from the external surescripts database, pulling all that information wherever they’ve gotten a surescripts prescription. Karen: Yes, it does. 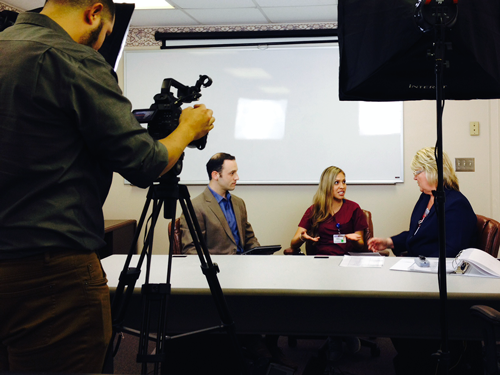 So our workflow – Nikki can talk a little bit about the medical assistant side of the workflow. Nikki: Yeah so what we have our back offices do is when they go in and they verify the medication, if the patient says oh and I need a refill on that, there’s a note section next to the medication so they’ll put in the note section “needs refill,” “no refill needed,” through the whole medication so it’s very handy for the providers cause once the back office clicks the “verified,” they can just kinda go through that list and say “okay, I see all your medications are up to date and it looks like you need a refill on these two or three – so it’s very handy for the providers back office cause they can just look at it at a glance, they don’t have to go through the whole list, they could just say “okay, these 3 or these 4 need refill. Our back office and our providers work very closely with the medication reconciliation. Adam: How successful would you say you are with that currently? I know we always want to improve, we always want to get better, but where are we now with that? Nikki: I want to say we’re in the 90s. Karen: Yeah, our meaningful use measures, we measure that so we’re in like 95%. Adam: Do you think that has made an impact on your productivity, workflow or anything like that? Karen: When we first signed on with eClinicalWorks, when we didn’t have any medication or any information list put inside of our EMR, because we chose to bring that in ourselves. It took a lot of work in the beginning but once you have it in there is so awesome. Nikki: It’s so worth it. Karen: It is, yeah and medications don’t change that frequently unless they have an acute illness and you know, you need to give them an antibiotic or something like that. Usually their chronic medication stays the same, so once you have that, patients don’t remember their medications, you can go through it, look at their external RX to verify it and it’s pretty accurate. Adam: Now, while we’re on the topic of medications, I heard you recently got some tools to help you with electronic prescribing of controlled substances, is that correct? Karen: Yes, so Nikki and I had a conference call with eClinicalWorks, I guess that’s a new service that eClinicalWorks now has, and so now you can prescribe narcotics via eClinicalWorks, where in the past we had – we could prescribe all the medicines but if it was a control substance we had to write a prescription. So you had to pay for controlled prescription pads, so we just ordered our little token I think that’s what it’s called? Nikki: Yeah, still waiting for those to come in. Karen: From what I understand, and I haven’t used it yet, is that once I receive my token, I can put it on my badge and keep it with me and when I get ready to order a controlled substance then it gives me this verification code on my badge and then my login is a verification that it is me and I’m able to send, electronically, that prescription to the pharmacy, which is really wonderful because there is a lot of abuse with narcotic medications. You’re always worried about your prescription pad and that getting stolen from you or people taking information off your prescription pad – your DEA number, your license number and somehow recreating a prescription pad with your information and using that to phone in medications or write prescriptions. Adam: So, all sorts of metrics and things, going back and forth, are you also measuring any kind of provider productivity? Nikki: So we do monitor the providers, I monitor their meaningful use monthly, I have spreadsheets and snapshots of how they’re doing and I know Peter Garcia, our clinic manager, and Karen, they do the performance improvements so the PI, monthly, to see who the star providers are, how many patients they’re seeing an hour, things like that, that you’ve been doing for some time now. Adam: What are some of the key things that tell you a provider is doing a good job, maybe not hitting the mark, I shouldn’t say doing a good job or not doing a good job, I’m sure they’re all doing good jobs, but there are certain things that they’re looking for, maybe the tracking, what are those things for you? Anything in particular? (Talking to Nikki) I know you said Meaningful Use. Karen: Well, we look at all their meaningful use measures, and then we look at, on the right chart panel, they give us the CDSS, on the right chart panel there’s a tab and it’s called CDSS’s and basically, for the providers, we look at those numbers, it tells you when the patients due for a papsmere, when the patients due for a flu shot, if the patient’s due for maybe a colonoscopy, if the patient’s a smoker, it lets you know to educate them about smoking and trying to get them to quit. So we look at those measures, we look at those numbers to see how our providers are doing. It’s not always about the number game but about giving excellent care to our patients and making sure that we’re also doing healthcare maintenance and making sure that the patient are getting all those things done that are due for their age group. The CDSS is not really an alert but it’s there on your right chart panel and it just reminds you of the healthcare maintenance, things that need to be done for that patient, and they’re very important like mammograms and colonoscopies and things like that, that are due, just to keep people well and to make sure we’re catching things before they become a problem. Adam: What other types of benefits have we seen by being on a single database? Any kinds of customization benefits? Karen: I think in 2012 we signed on with eClinicalWorks and implemented our EMR, and we hired a consulting group to come in and assist us, because I had never been on an EMR before and none of us knew what we were really doing, and so we brought this consulting group in and they built all these templates and they had all these workflows – none of them worked for us. Once they left we were like “okay, this just isn’t working and we ended up recreating all that stuff ourselves because it is great you can customize the workflows and things like that, and customize the templates, but they have to be customized to what we’re doing and we didn’t really know what we were doing, as far as an EMR is concerned, because when you’re on paper and then you go to an electronic record, your workflow is completely changed, but we understand our patient population, our physicians, our providers, our back-office and what works for us. If somebody comes in, it sounded good on paper, cause I was part of it, I was like “oh, yeah this sounds really good” and in reality, when we tried to do it, it didn’t work so well. Nikki: Well, I think what a breaker was for us, too, was when they came in they were like “oh we’re going to build this for you, we use this for these offices…” we’re like oh this is great. Once I went to training and once you went to training (talking about Karen) we were like no that’s not going to work, you know. 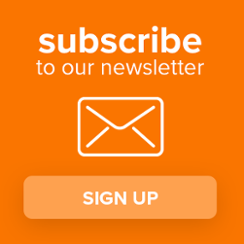 I think having us trained, we’re more educated on the EMR, that’s what helped us and that’s when we grabbed all of their stuff and really candid – we built from scratch. She and I sat, and we’ve seen dummy patients, and we were going to build our defaults from here, our workflows from here. Karen: We have all of these different specialties and one EMR is able to handle all those specialties. Adam: Now, do you feel like being a certified trainer can give you an edge when it comes to making all of those different specialties work in one EMR? Nikki: Most definitely because every provider is different, they’re going to say “okay I always chart this HPI, I don’t do this, I do this,” so day 1, training with me, they learn the EMR but also once I go through my itinerary, I tell them “okay, I want you to show me.” So that’s kind of an eye-opener for them, like “oh, man I really have to use this thing.” So once they start using it I’m like, “you’re not going to use it with all of these things, we’re going to cut all this out – I’m going to build a category that says Nephrology, so we’re only going to have your categories in here, we build your defaults, from your normal to your abnormals.” So it makes them feel more at ease that I’m building it for them, it makes them feel special, it makes them feel more confident, like “okay I can go in here and I can chart on things that I would normally do, they don’t see everything else that eClinicalWorks has to offer.” It’s very focused on their specialty. Karen: And their order sets, you build those for the doctors. Karen: So, if you’re a nephrologist, you’re really focused on the kidney, and you’re going to order labs and X-Rays that are pertaining to the kidney and that’s all your order set needs to be. You don’t need to see all the other thousands of other labs and X-Rays that could possibly be ordered because you’re probably never going to order those, but if you do, you have the availability of picking them up. For the most part, you’re just going to pick up that order set and order these things and you’re done. Adam: And that’s what it’s made for, make your workflow fast and easy and customized to you. So what are some of the other projects that have been possible because you have a certified trainer on staff? Karen: Well, the possibilities are endless, really. Nikki’s great, she’s wonderful, she knows the EMR better than anybody. I can’t say enough great things about having a certified trainer, I think every facility should have one or every office. I mean she stays on top of all the EMR issues and problems, she’s an EMR tech support, our IT dept. hardly ever has to come out into our clinics, and Nikki handles everything. Not only does she understand the EMR really well, but she understands the technical side of it really well, also. And that’s self-trained and she’s done a great job with it. Adam: I imagine it also comes in handy when, like you said early on, you had those templates that you found didn’t work, you must have had to change those and then you probably had to let people know about all those changes and get people on the same page, I’m assuming that that came in handy, as well. Karen: Well, we’re a really good team, Nikki and I because I’m a provider, I don’t always have time to really research all these things, although if I see something I don’t like, the first thing I do is take a picture of it or do a snippet of it, and I send it to Nikki and I say “Nikki find out about this, I’m not liking the way this is looking” or “why can’t it do this for me?” and so she researches it with eClinicalWorks and she comes back with answers – we say “okay this is great, let’s train all our providers.” So anytime we find new things, we work together. If I didn’t have somebody to hand things off to like that, it would probably never get done because, as a provider, you just don’t have time to do those things. And sometimes the providers are the ones that have to really use the EMR more than probably anybody and they’re not always heard.” So, having a certified trainer that will listen and hear your complaints, if you’re unhappy about something and have the capability of fixing that – making all of our providers happy, that’s the best part about that, it’s fixable, anything they don’t like. Adam: Sounds like technological therapy, almost. Karen: I mean, it’s just little things, little things that people want differently and it’s so customizable and they don’t realize it, unless they have somebody that can show them how to do that. Adam: So you must have things that make your job easier (talking to Nikki) when you go to show all these people like “yes I’ve heard you. These are all the changes that we’ve made.” What do you do when that happens? Nikki: So, for me, anytime a provider comes to me saying “Nikki, this isn’t working” or “I’m finding I’m doing this a lot,” if I don’t know the answer for stuff, then I’m like “okay let me get back to you, let me get to eClinicalWorks to see what I can find.” eClinicalWorks has made it very, very easy with their customer portal, they have tons of webinars, they have documentation, so I’m constantly going on there, watching videos, cause everything changes just like our workflows. eClinicalWorks is constantly evolving, as well, so I want to stay up on my skills; so I’m constantly reading or watching those so I can learn and find out how to help our practice evolve and be a better trainer. Whenever I can’t find what I need, my SAM and our office manager, they’re really great at reaching back to me – if I have a question, they’re quick to respond. So, I’m really thankful for that, that I have the resources that I need to get back to our practice. Adam: If you had to look back and choose one workflow, that has made a big difference toward your success, what would you say that was? Karen: Well, there’s many things that have been very successful, in using eClinicalWorks and workflows, but one of the things that stand out to me on a provider’s side is the jellybeans. The jellybeans were a little overwhelming for a lot of providers in the beginning because if you could imagine you were on paper, and we used to just have stacks of charts and papers and labs and x-ray reports that we had to go through, and prescription refills, and we used to do that all on papers. Now, you get an EMR, you have these jellybeans and these are little things that look like jellybeans that tell you how many labs you have to review, how many x-rays you have in there to review, how many prescription refills, and that number starts getting pretty large, very quickly, when you’re seeing a lot of patients. I think, when you’re new on an electronic record, it can be a little bit overwhelming because you’re so focused on seeing your patients and trying to learn the electronic record, and you’re not realizing that “I have to look at these labs and X-Rays that come back.” I have to say that we’ve been very successful at keeping those numbers down and working on some workflows and how to manage those. Adam: Effective Jellybean Management seems to be one of those early hurdles for new practices and sometimes that can linger for a long time after your implementation when you’re trying to deal with those other things – it is good to know an effective way to deal with that. Now, what happens when providers are out of the office or on vacation, or, like you said, you have these per diem providers who are coming in once a week or maybe less frequently than that – how do you manage those jellybeans? Nikki: For them, we did create a jellybean buddy list – so, all of our full-time providers they are assigned a couple specialists, a couple of our per diems, so that way we know that these labs or these results are constantly being worked on. If we have a specialist that comes once a month, or once a week, they’ll have a buddy, so it’ll be one of our full-time providers who will review those results for their patient. Adam: And you have a list of these buddies? Nikki: Yes, so we have a list of these buddies. We have one right here, and we have them posted in all of our work stations, so whoever is working on the labs or if they get something from the inbox, or a call, telephone encounter, they know – okay, if I have something for this specialist, I’m gonna send it to their buddy – and they have these references guides whenever they may need them. Both: Yes, we really hope so. Adam: If you’d like the see more of our podcasts, you can check them out on my.eClinicalWorks.com – they’re also available on YouTube and for download on iTunes. For the eClinicalWorks Podcast, I’m Adam Siladi, thanks for watching.